You've heard the interviews, you've seen the best dressed list, and now we've got the ultimate behind-the-scenes look at last Monday's (May 2nd 2011) Costume Institute Gala. Walk up the red-carpeted stairs, step inside the Metropolitan Museum of Art, and check out the biggest party of the year. Only here can you get a peek at the featured exhibit, "Alexander McQueen: Savage Beauty," view the never-before-seen performance of Florence + the Machine inside the Temple of Dendur, and catch a glimpse of Beyoncé and Jay-Z, Gisele and Tom, Gwyneth, and many more. Dva mesiace a dva týždne uplynuli od chvíle, čo si svet uctil pamiatku velikána Alexanda McQueena. Dva mesiace a dva týždne mi trvalo, kým som vybehol po schodoch vedúcim k monumentálnej bráne nesúcej jednoduchý nápis: Savage Beauty. Retrospektívna múzejná inštalácia nazvaná „Krutá krása“ mapuje legendárne míľniky talentovaného vizionára, ktorý pozemský svet opustil 11.februára minulého roku. Niekoľko stovák metrov štvorcových v Metropolitan Musem of Art sa na obdobie troch mesiacov stalo najemotívnejším a najestetickejším pietnym miestom na Manhattane, ktorého spirit balansuje medzi módou, krásou, bolesťou, utrpením, katarziou a nekonečnou dávkou kreativity premietnutej do odevu. 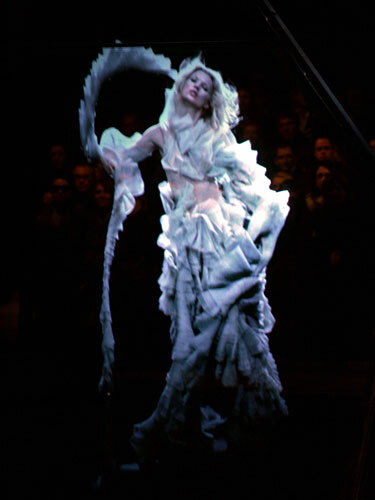 Impozantná expozícia nevynechala ani legendárny hologram (KLIK) Kate Moss, ktorým McQuuen šokoval Parížske publikum v roku 2006. Two months and two weeks have passed from the time the world paid tribute to the genius Alexande McQueen. Two months and two weeks it took me until I ran up the stairs leading to the monumental gate, bearing the simple inscription: Savage Beauty. Retrospective museum installation called "cruel beauty" maps legendary landmarks talented visionary who left the earthly world 11. February last year. Several hundred square meters in the Metropolitan Musem of Art for a period of three months and became most more emotional and most aesthetic reverent place in Manhattan, whose spirit balance between fashion, beauty, pain, suffering, and endless katarziou dose of creativity reflected in clothing. An impressive exhibition of the legendary miss hologram (click) Kate Moss, who McQuuen shocked the Parisian public in 2006. Gareth Pugh (KLIK) minulý týždeň verejne a zaživa pochoval módnu ikonu a zberateľku Haute Couture Daphne Guinness (KLIK) Obklopená sviečkami, oblečená do čipkovaných šiat od Alexandera McQueena a v rukavičkách z drahokamov za vyše jeden milión dolárov. Tak vyzerala inštalácia pohrebu jednej z najvýraznejších módnych osobností súčasnosti. Teatrálny britský návrhár sa rozhodol uctiť si pamiatku zosnulého Alexandra McQueena vskutku nekonvenčným spôsobom a zároveň upriamiť pozornosť módnej verejnosti na tvorbu britského šperkára - Shauna Leana, s ktorým Daphne nedávno nadviazala spoluprácu.Výsledkom sú avantgardné rukavice vytvorené z osemnásť karátového bieleho zlata a piatich tisíc diamantov, ktoré boli prezentované práve na "mŕtvej" Daphne. Ide o jedinečný couture kúsok, ale šepká sa, že dvojica spolu plánuje vytvoriť celú kolekciu šperkov. Gareth Pugh last week publicly buried alive a fashion icon and collector Haute Couture Daphne Guinness, surrounded by candles, wearing a lace dress by Alexander McQueen and precious gloves for more than one million U.S. dollars. That seemed to install the funeral of one of the most fashionable celebrities today. British theatrical designer decided to honor the memory of the late Alexander McQueen really unconventional way and also draw the attention of the public to create a fashionable British jewelers - Shaun Lean, with whom Daphne recently followed up cooperation. Result avant gloves are made ​​of eighteen karat white gold and five thousand diamonds which were presented to the right of "dead" Daphne. This is a unique piece of couture, but the whispers that the couple planned together to create a whole collection of jewelry.